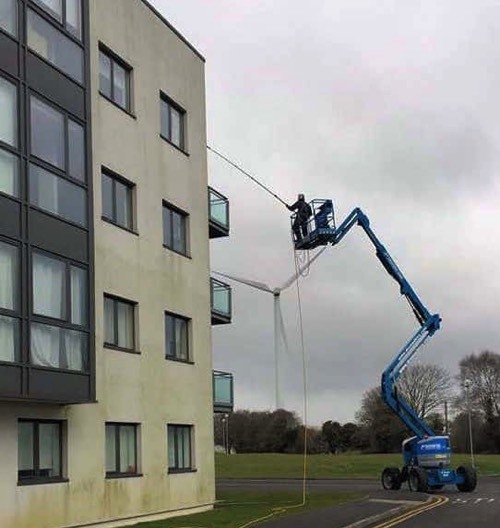 Wall render cleaning in Birmingham and surrounding areas by specialist wall render cleaning tradesmen, including cement renders and also K-Rend and Monocouche wall render products. 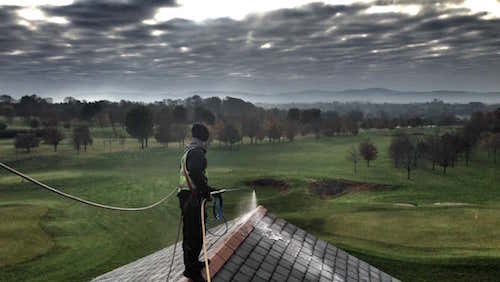 Birmingham and West Midlands weather is wet and has high humidity but our product and the method of application has been well thought out for all our weather conditions. Save Thousands by not painting! We rarely need access to scaffolding so you can save massive amounts of money by not painting. All the products we use for cleaning are eco friendly and bio degradable to keep you, your pets and the environment safe and clean. I think you'll agree that dealing with a salesman in your home can be intimidating. So we don't have any direct sales people trying to pressure you into a deal. You get a written quote, emailed to you if you wish, valid for 30 days so you can have a think, take your time, and make the right decision for you. Over the years plasticised/polymer based wall render finishes have become the norm for the construction industry due to their flexibility in offering architects and designers new finishes that are much better than just paint. These are specialised K-rend wall renders. You only have to look at the number of high rise buildings in Birmingham that are finished with renders in an effort to save on maintenance and improve on aesthetic appearance. These are low maintenance and don’t need to be painted but need to be cleaned now and again. 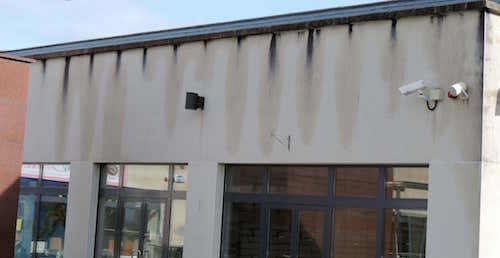 High levels of wall insulation encourage the growth of algae on the render because the outside wall temperature stays close the outside ambient temperature and because of this has a high moisture content. In years gone by when the insulation was not so effective the wall temperature would be a bit higher and this has the effect of keeping the outside wall leaf drier therefore reducing mould, algae and lichen growth. Sometimes rendered walls are patchy in colour and this may be due to inconsistent insulation effectiveness within the walls or maybe down to heat sources on the wall (such as radiators) making drier areas on the wall inhibit the growth of black mould, green algae and lichens. We specialise in eco friendly wall render cleaning that’s not using high pressure water blasting/cleaning and completely bleach free. We use a biocide applied with a soft shower spray only using a fraction of the water used in high pressure water cleaning. A wall render soft wash causes no damage to the wall render or cement pointing and gives a deeper longer lasting cleaning effect. Our product will not stain your paintwork either. Everyone is safe when using our soft wash product as it is not toxic for people, pets and plants. 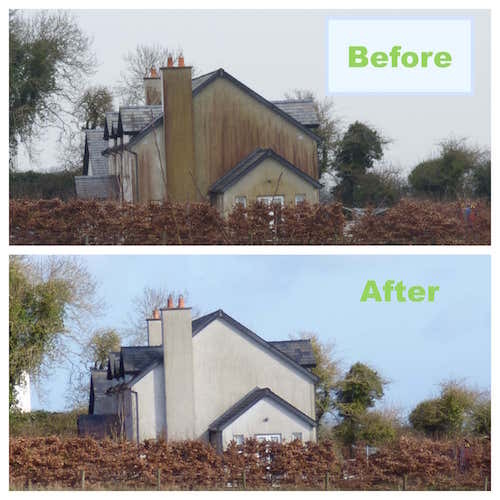 High pressure cleaning will damage wall render and roof pointing that holds the ridge caps on your roof and if you only want the lichen and moss removed then this creates unnecessary work and expense for you. In some cases old slate and terra cotta tiles can be irreversibly damaged from high pressure water roof cleaning. Concrete roof tiles will lose their colour after pressure cleaning and this colour loss can be patchy so the resulting finished job is usually mediocre. You’ve probably seen how some porous surfaces (like sandstone) really get green and slimy or covered in black mould and you would be forgiven to think that these surfaces are beyond repair - they’re not. With a treatment of a product that attacks algae, lichens and mosses these surfaces can be brought back to life again. Pressure cleaning can only strip the surface, and too high pressure can damage the stone, but once treated with a deep cleaning antiseptic based biocide and then a light pressure clean will remove all the dead organic material. Our antiseptic biocide is eco friendly and safe for people pets and plants. Then your patio or paving just needs to have mortar pointing repaired, or kiln dried sand brushed in to the joints, and then sealed. Is your decking really slippery? Then the algae causing this needs to be killed off with an eco friendly biocide. We apply the biocide by scrubbing it in to the timber. After that, the decking is cleaned evenly all over without excessive pressure and won’t leave stripes on the timber like a pressure lance would. This is where it pays to have the correct equipment to do the work. A good coat of decking oil brings everything back to looking good.